აქ წარმოდგენილია პიტერ გებრიელის სრული დისკოგრაფია. მუსიკოსის მიერ ჯენესისთან ერთად ჩაწერილი ალბომები იხილეთ სტატიაში ჯენესისის დისკოგრაფია. 2004 ვოკალური პარტია თამაშის Myst IV: Revelation საუნდტრეკზე. მასში ასევე ჟღერს სიმღერა Curtains. 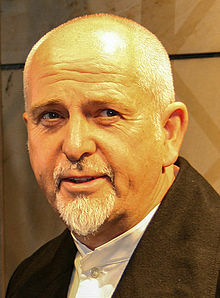 ↑ 1.0 1.1 1.2 1.3 1.4 Peter Gabriel UK discography. chartstats.com. დაარქივებულია ორიგინალიდან - 2012-05-29. წაკითხვის თარიღი: 25-09-2009. ↑ 2.0 2.1 2.2 2.3 2.4 allmusic (( Peter Gabriel > Charts & Awards > Billboard Albums )). Allmusic.com. წაკითხვის თარიღი: 27-12-2009. ↑ 3.0 3.1 3.2 3.3 3.4 3.5 3.6 RIAA Certifications. Recording Industry Association of America. წაკითხვის თარიღი: March 5, 2010. ↑ Gold & Platinum Certification – July 2003. Canadian Recording Industry Association. წაკითხვის თარიღი: 2010-08-20.